Fatherhood caught David McGlynn by surprise. His sons arrived in quick succession—the first when the author was a dirt-poor student and the second not long after he’d moved his family across the country to start a new job in bucolic Wisconsin. As a result, McGlynn found himself colliding with fatherhood, at once scared to death and utterly thrilled. Just like many new fathers, he hopes he’s doing the right thing—but he’s never quite sure. One Day You’ll Thank Me translates the small, often hilarious moments common among parents of young children, especially dads, into “life lessons” about fatherhood. 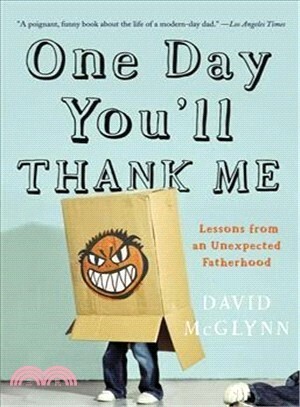 Comprised of interconnected chapters—many of which have appeared in such prominent publications as The New York Times, Men’s Health, Parents, Real Simple, and O, The Oprah Magazine—the stories invoke a sense of humor and honesty that expand our understanding of what it means to be an American dad. DAVID MCGLYNN is the author of the memoir A Door in the Ocean and the story collection The End of the Straight and Narrow, winner of the 2008 Utah Book Award for Fiction. Recent work—including excerpts from One Day You'll Thank Me—has appeared in The New York Times, Men's Health, O, The Oprah Magazine, Real Simple, Parents, and elsewhere. Three of his essays have been named Notable Essays in the Best American Essays anthology and another, "Rough Water," appeared in Best American Sports Writing in 2009. He teaches at Lawrence University in Wisconsin.